Charlie Chan of the Honolulu Police, and Inspector Fife of Scotland Yard tour the offices of the New York Police Department with Inspector Flannery, in order to study the methods used by that department. While dining with Chan in a Chinese restaurant, Fife receives a telephone call informing him that Sir Lionel Grey, former chief of Scotland Yard, has dropped dead in the penthouse apartment office of Barry Kirk in Wall Street. Grey had been using Kirk's residence as his base of operations while investigating a case. As Fife and Chan meet Flannery at the scene, Kirk informs the group that, before his death, Grey was about to solve a big murder case that had baffled Scotland Yard for years, and had invited several guests to a party. He had left the party to take a phone call in Kirk's office where he died suddenly and mysteriously. 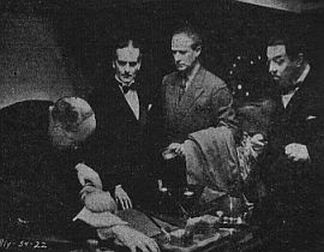 The doctor on the scene assures the group that Grey died of a heart attack, but Chan notices a dead cat in the room, stating, "Cat is like rich man's heir - never dies out of sympathy." The detective surmises that Grey's death was not natural, and, whatever method was used to kill Grey also killed the cat. After Fife asks Chan if the simultaneous deaths may be mere coincidence, Chan replies, "I always suspect coincidence - same as nose always suspect ancient cheese." The assembled guests are all questioned, and each person seems to be hiding something. In the office, the police discover that the safe has been robbed - a possible motive for the crime - and learn that John R. Douglas, a chemical manufacturer, had made the last phone call to Grey. Even though Chan has plans to return to Honolulu on the birth of his newest baby (the Chans' eleventh - a boy), he decides to stay on for the investigation. At a cafe, Shirley Marlowe meets with John Douglas, and he tells her that Sir Lionel Grey had demanded to know the whereabouts of an Alan Raleigh, threatening to take Shirley, Raleigh's former lover, back to England as an accessory to murder if John would not give the information. John then asks Shirley to marry him, stating that the two of them can go away together. After an interview with one of the assembled guests, Chan seeks out and finds Shirley, a Follies performer at a theater where she is a well-known masked dancer. Shirley confesses to the detective that, years ago, she had fallen in love with Raleigh before she had discovered the crime that he had committed. When she had learned of the crime, Shirley fled, not wishing to incriminate a man whom she had once loved, and she has been pursued around the world by Scotland Yard ever since. Chan promises to keep Shirley's secret, and goes out to find Li Gung, Raleigh's servant, whom Shirley had mentioned during their conversation. Locating Li Gung's residence, with the help of information given to him by Kee Lin, owner of the Chinese restaurant in which Chan and Fife had dined, the detective gains no useful information, and has only succeeds in arousing the suspicions of Li Gung. Back at Kirk's office, it is revealed to Kenneth Dunwood, another guest on the night of the murder, and Kirk, that gas masks were found at Douglas' chemical factory. Back at the theater, Shirley writes a note to Chan, stating that she will tell the police everything. The note is given to her chauffeur to deliver to the detective. However, an unidentified man drops a small poison gas-filled bottle into the car, killing the driver. At the police station, John is brought in. He denies his acquaintance with Shirley, until she tells him that she has confessed to everything. John then informs the group that he had seen a "Chinaman" enter the building with a basket on the day that he had met with Grey. Chan then returns to the home of Li Gung where the latter attempts to kill him using an elaborately contrived trap involving a hidden gun. However, at the last moment, a black cat nudges the gun, which causes it to point instead at Li Gung, who falls victim to his own trap. Later, at the check-in room at the Cosmpolitan Club, Chan discovers Sir Lionel's briefcase, which he determines from the register, was checked in after the murder. Fife and Flannery watch with him who comes to retrieve it, and the trio is surprised to see that it is Barry Kirk who picks up the important item. After Kirk has explained that he was picking up the briefcase for someone else, Chan, Fife, and Flannery secretly wait in Kirk's office, along with Shirley, and Kirk is instructed to answer the door and pretend that he is alone. Soon, Kirk opens the door for Dunwood who thanks Kirk for getting his briefcase at the club. Kirk asks Dunwood when he had gotten his membership card to the club, and it is revealed that Dunwood had not been to the club that day as he had told Kirk earlier, but that he had really dropped off the briefcase just after Grey had been murdered. After Shirley identifies Dunwood as Alan Raleigh, Dunwood grabs a gun that Chan had "clumsily" dropped on the floor while "sneezing." After confessing to Grey's murder as he holds everyone at gunpoint, Dunwood attempts to escape but Chan subdues him as Dunwood tries to shoot the detective with the gun that is actually unloaded. "Old habit," Chan tells a relieved Inspector Fife, "wife never likes loaded gun, on account of children." NOTES: This is one of the four "lost" Charlie Chan films, having been destroyed in the fire that consumed the 20th Century-Fox film storage facility at Little Ferry, New Jersey on July 9, 1937. An illustrated script-based reconstruction of Charlie Chan's Chance can be viewed at our collection of "lost" Charlie Chan films. The novel, Behind That Curtain, upon which this film was based was originally published as a serial in The Saturday Evening Post between March 31 and May 5, 1928. Fox also produced a film based on the same source entitled Behind That Curtain, in 1929, which was directed by Irving Cummings. The film starred Warner Baxter and featured E. L. Park as Charlie Chan, who appeared but briefly in the movie. The cat who saves Charlie Chan's life in this film (Charlie Chan's Chance) by accidentally redirecting the aim of a gun that instead kills the villainous Li Gung, was named Puzzams and was owned by Nadine Dennis, the sister of child actress Marjean Dennis. Some heads, like hard nuts, much better if well cracked. Under strong general there are no weak soldiers. Good kitchens kill more men than sharp sword. Cat is like rich man's heir - never dies out of sympathy. Sometimes very small cloud hide sun. Maybe some people on sea of matrimony wish they had missed boat. Chef who cooks with gunpowder make quick fire. Nothing but the wind can pass the sun without casting shadow. When friend asks, friend gives. Silence is golden except in police station. Even wise fly sometimes mistake spider web for old man's whiskers. Only foolish mouse plays with cat. Do not tangle foot in fringe of murder. One at a time is good fishing. It is difficult to pick up needle with boxing glove. Friends, like fiddle strings, should not be stretched too tight. Out of the darkness of the unknown comes bright spark of light. A fool and his money never become old acquaintances. Guest who lingers too long - becomes stale like unused fish. It takes very rainy day to drown duck. Remember kind hearted elephant who tried to help hen hatch chickens. Busy as one-eyed cat watching six mouse holes. The impossible sometimes permits itself the luxury of occurring. Useless as life preserver for fish. Good head always gets own new hat. Dead as sardine in honorable tin can. Sometimes hope become scarce as midnight rainbow. Man is not incurably drowned - if he still knows he is all wet. The geese who laid the eggs deserve the credit. (Inspector Flannery: "Well I hope you dig up something. It sometimes takes two heads to.") Also takes two heads to make empty barrel. (Second Chorus Girl: "No laundry today." [to Chan, thinking he is from a "Chinese laundry"]) (noting the chorus girls' decidedly scanty costumes) So I notice. (To Henry, an over-jealous Boy Scout) ...every day when you are doing kind deed, remember kind hearted elephant who tried to help hen hatch chickens. (Henry: "What did he do?") He sat down on hen's eggs. (Inspector Flannery: "Was the boy born in hospital?" [referring to Chan's new son]) Oh no - home made! (Inspector Flannery: "Dead?" [referring to Li Gung]) Dead as sardine in honorable tin can. He invited me into trap but caught wrong fox. (Inspector Flannery: "Did you kill him?" [Li Gung]) No - he saved me trouble by politely killing himself. Previous chapters of Fox's Charlie Chan series are bound to bring comparisons, but this latest won't suffer. A compact, frequently suspenseful and sufficiently convincing detective feature, it rates with its predecessors as entertainment and should equal the fair grosses they registered. Because Fox isn't overdoing the Charlie Chan character with too frequent repetition, the Oriental detective is still on his pins as a reliable screen character, with the quality of 'Charlie Chan's Chance' setting things up for a future return. As long as they don't kill Charles with more than bi-annual release, Warner Oland and Fox can probably continue along the same lines indef. In solving the new mystery Chan has the help of Inspector Fife of Scotland Yard and Inspector Flannery of New York. But as far as really helping they're just a couple of stooges. Assistant solvers of Biggers' murder puzzle, H. B. Warner and James Kirkwood can't conceal the suppressed desires behind their finely drawn performances. They don't seem real when so easily baffled by foolish facts which can't fool Chan. But, after all, Chan is the boy who's getting the build-up. Another British detective, who gets into the plot as a corpse, is murdered while working on a case in New York. The path to solution is studded with countless false clues and the all-important erroneous arrest of the juve love interest team, Marion Nixon and Alexander Kirkwood. Three people are killed on the way. One is Li Gung (Edward Peil, Sr.), the Chinese accessory to the criminal master mind. The m. m. is James Todd, whose too youthful appearance in the heavy role accounts the picture's chief note of implausibility. The killing of Li Gung, though arriving some time ahead of the climax, is the most exciting sequence. He's killed by a bullet intended for Chan, with the stage set and death contraption rigged up for Chan's benefit before he arrives. A black cat walks across the table, pointing the gun at Li Gung and away from Chan. Li is destroyed by his own creation. Chan is sitting in the hot seat while the audience waits for the trigger to snap. Productionally, this talker is good-looking without denoting undue extravagance. The principal location, a penthouse, is neat, and a helpful attitude of realism is gained through the skyline background which looks like New York from the Empire State building tower. Another standout technical detail is the studio version of the East River at night, whose scenic excellence lends importance to an otherwise unimportant situation that under less expert handling might have been mere padding. THE CHARGE AGAINST ISADOR ROSENBLATT, ACCORDING TO INSPECTOR FLANNERY: "...entering a delicatessen store on 116th Street and stealing a ham." THE CHARGE AGAINST EVELYN VANDELEAR, ACCORDING TO INSPECTOR FLANNERY: "...blackmailing a man out of eight hundred dollars." THE CHARGES AGAINST THE RAJAH MANGAPORE, ACCORDING TO INSPECTOR FLANNERY: "...fortune telling and swindling." THE RAJAH MANGAPORE'S ACTUAL IDENTITY: "Benny the Dip"
ACCORDING TO DR. HAMMOND, THE CAUSE AND TIME OF SIR LIONEL GRAY'S DEATH: "Unquestionably...a case of heart failure. I should say that Sir Lionel has been dead over an hour." THE TIME THAT GLORIA GARLAND HAD INTENDED TO ARRIVE AT BARRY KIRK'S PENTHOUSE: 8 p.m.
GLORIA GARLAND'S ACTUAL TIME OF ARRIVAL, DUE TO THE BREAKING OF HER PEARL NECKLACE: 8:20 p.m.
A DESCRIPTION OF KENNETH DUNWOOD, ACCORDING TO HIMSELF: "Australian educated in London and Heidelberg." WHERE THE OWNER OF THE O. KAY CLAIMED TO BE, IN AN ATTEMPT TO PROVE HIS 'INNOCENCE": "...I got six witnesses can prove I was in Donovan's"
ACCORDING TO THE OWNER OF THE O. KAY, THE EXACT LOCATION OF WHERE THE GAS MASK WAS FOUND: "Right off the Ninety-sixth Street pier." ACCORDING TO THE OWNER OF THE O. KAY, THE DAY HE FOUND THE GAS MASK: "Early last Tuesday." Inspector Flannery: "Last night in Washington Heights he put a man to sleep with a blackjack..."
Manager: "A Chinaman came here a few days ago trying to get it..."
Inspector Flannery: "This is Benny the dip. He used to imagine he was a pick-pocket but he couldn't get his hand in and out of a sugar barrel." John Douglas: "Inspector, isn't it possible that if the British home secretary knew the facts of this case he would waive extradition?" Inspector Flannery: "This young lady is what we call a live wire." Inspector Flannery: "This is our Rogues' Gallery." Kenneth Dunwood: "But you left the room just after we lost the third rubber..."